CARABINER KEYCHAIN OVERRUNS ONLY $0.25 EA! WHILE SUPPLIES LAST! Carabiner Lighter Holder (Patent Pending)... Combination carabiner keychain and snug holder for a BIC® Mini Lighter. SALE PRICE! (U.S. Currency) Lighters sold separately. 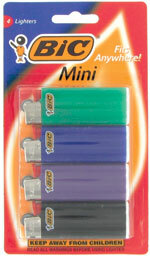 BIC® Mini Lighters only $1.00 ea (reg. $1.25)! *Set-up charges: Engraved ($25); Pad Printed ($50). One side only. Second side engraving available. Engraving shows up frosty white, Pad printing in one color, Most colors available. Price includes: one side engraved. Second side engraving and pad printing available on lighters. Please contact us for larger quantity pricing and lead-time. Assorted colors ok. PMS color matching at no charge. Min. 2500 pcs. BIC® is a trademark of BIC USA Inc.
Carabiner Lighter Holder™ Patent Pending. 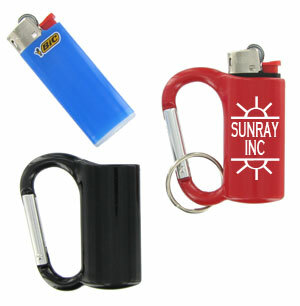 A convenient metal carabiner keychain with built-in holder for a BIC® Mini Lighter or similar size disposable lighter. The Carabiner Lighter Holder features an integrated 2.25" carabiner keychain for attaching to straps and loops as well as space to insert a mini lighter. Never misplace your lighter again! Easily unclip for convenient use of your lighter. Spare disposable lighters are available here at wholesale prices and at most convenience retail stores. Carabiner Lighter Holders make great party favors, tradeshow giveaways, business and new product promotions, retail sales and more. Large engraving and imprint area for your name, logo or message on one or both sides. Split ring optional sold and packed separately. Carabiner lighter holders are no load bearing and not for climbing.